Shower loved ones with a sweet party atmosphere! 'Baby Girl Clothes Line' Baby Shower Banners come in two sizes: one large letter banner that spells out "Baby Shower" and a string garland that spells "It's a Girl." They feature a baby clothes theme with tiny heart accents. Easy assembly required. Shower loved ones with a sweet party atmosphere! 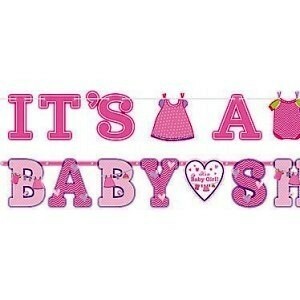 'Baby Girl Clothes Line' Baby Shower Banners come in two sizes: one large letter banner that spells out "Baby Shower" and a string garland that spells "It's a Girl." They feature a baby clothes theme with tiny heart accents. Easy assembly required. Banner pack includes: Letter banner, 2.55m (8 3/8ft) with 25cm (10'') tall letters Mini banner, 1.8m (6ft) with 10cm (4'') tall letters Cord.